W.B. Yeats writes about Sligo in his first surviving letter, dating from sometime in autumn of 1876. He was 11, in England with his father, and replying to his little sister Lily, who was in Sligo and had sent him a drawing of a mountain he already knew well: Knocknarea. 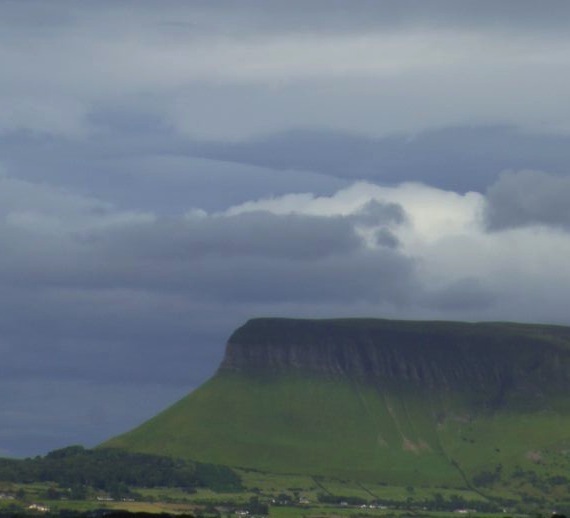 This spectacular mountain already featured prominently in young Yeats's imaginative landscape -- together with its larger fellow across the waters, Ben Bulben. Knocknarea, at the top of which legendary Queen Maeve lies buried beneath her great cairn of stones, and Ben Bulben, in whose long shadow Yeats himself now rests, hold Sligo town in their protective lion's paws on either side of the city and its river, with strands, waterfalls, and people and their homes in between. 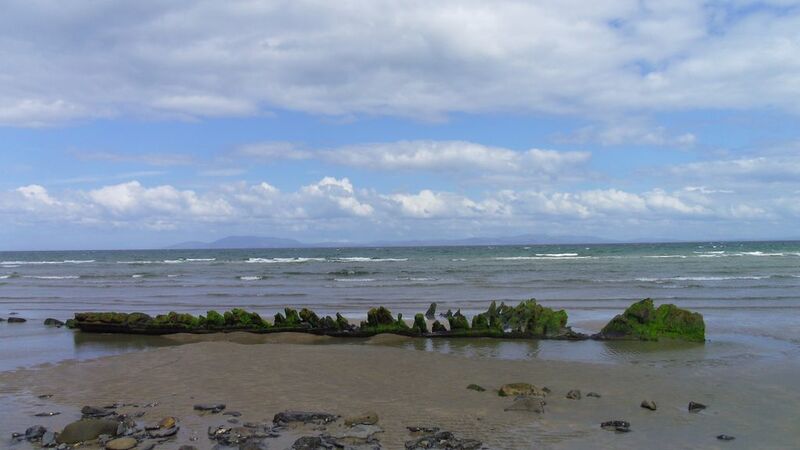 What did Yeats love about Sligo? First, having family there - his mother's people, the Pollexfens and Middletons, were of Sligo. Second, the landscape and freedom to range, both physically, and imaginatively, within that landscape. When Yeats, as a middle-aged man, began to write down his first memories of Sligo, he tellingly put it in the present tense: "where I live with my grandparents." Sligo is always now. 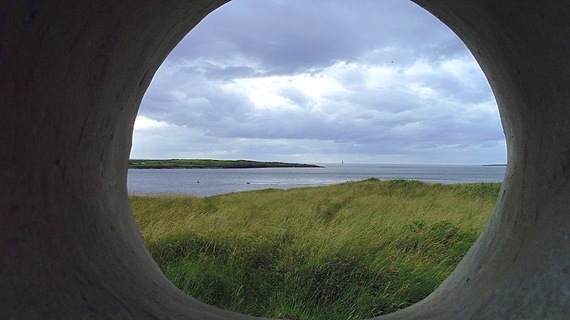 Willie also loved Rosses Point, to the north and out the river to the sea, where he and his siblings and cousins played. The mysterious family house there, Elsinore, was a place where the little dark-haired boy could play Hamlet and look for ghosts: "There were great cellars under the house, for it had been a smuggler's house a hundred years before...." The house has been allowed, indeed encouraged, to completely go to ruin, which is most unfortunate. Now roofless under its ivy, Elsinore is still possessed of magical beauty. Yeats wrote two of his earliest long works in Sligo, and set them there: the poem The Wanderings of Oisin (1889) and his only completed novel, John Sherman (1891). In December 1888, back in London but longing for Sligo, Yeats had, as he stood in The Strand looking into a window-display, what James Joyce would call an epiphany. Feeling an intense emotion that sparked personal memory for him, he rushed home with a new poem in his head. His sister Lily remembers him bursting in the door "with all the fire of creation & his youth." 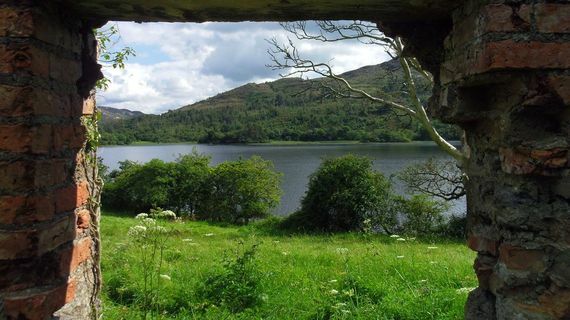 The poem is set in a place Yeats had planned, ever since he was a boy, to live in a cottage by himself - on the island of Innisfree, in Lough Gill, the largest lake near Sligo town. Yeats would later say "The Lake Isle of Innisfree," his best-known poem, was "my first lyric with anything in its rhythm of my own music." From the end of the 19th century until the rest of his life, Yeats spent little time in Sligo. He lived in Dublin, in Thoor Ballylee near Galway, in London and on the French and Italian Rivieras. He died in France in the little village of Roquebrune in 1939, without having visited Sligo for many years -- at least, physically. Yeats had asked his wife George that he be buried immediately in France upon his death, though not permanently, and without publicity: as George reported, "his actual words were 'If I die here bury me up there [in the Roquebrune churchyard] and then in a years time when the newspapers have forgotten me, dig me up and plant me in Sligo.'" Newspapers, readers, lovers of poetry everywhere will never forget Yeats. The place where you can be closest to his leading inspirations on this earth is Sligo, from the old sailor town to the sunsets of Rosses Point, in what Yeats dubbed the land of heart's desire. He told his sister Lily when they were old, in 1936, "No one will ever see Sligo as we saw it." No. But thanks to him, we can see the shadows of what he saw in his mind's eye forever, superimposed on the living landscape of a place where change comes to pass, but the topography beneath, the bones under the skin, remains. Said Yeats, of his brother Jack's watercolor "Memory Harbour," "When I look at my brother's picture... I recognize the blue-coated man with the mass of white shirt the Pilot and I went fishing with, and am full of disquiet and of excitement, and I am melancholy because I have not made more and better verses. I have walked on Sindbad's yellow shore and never shall another's hit my fancy." 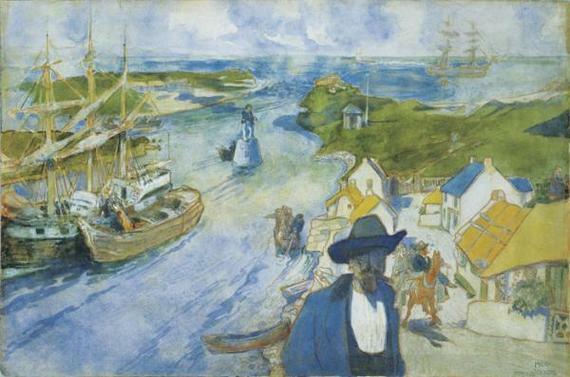 Jack B. Yeats, "Memory Harbour"
There is still a blue-coated man with a white shirt overseeing the channel at Rosses Point -- go and find him. They're all still here: Maeve's mountain and her cairn, to which, when you go, you must carry a stone. Ben Bulben's steep channeled sides, boggy top, and massive head thrust forward shiplike at the sea. 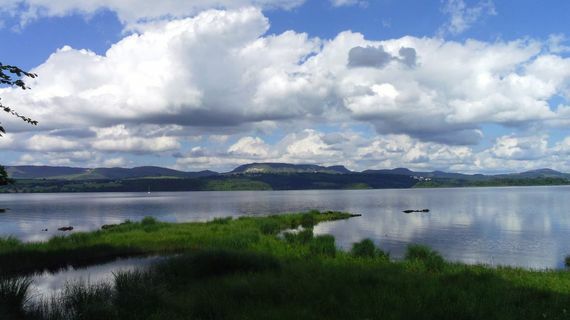 Shallow, tidal Lough Gill and the islands, including Innisfree, scattered over its surface. 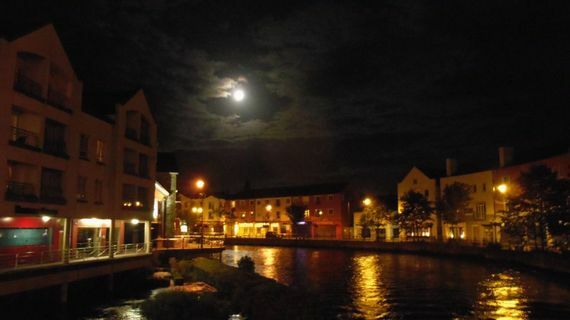 No one will ever see Sligo quite as Yeats saw it, but what he shared of it with us is the chief reason Yeats scholars, students, admirers, and followers have gathered in Sligo annually for the past half century to celebrate him. The Yeats Society of Sligo hosts and sponsors events year-round, but for two weeks in the summer the Yeats International Summer School fills the town. 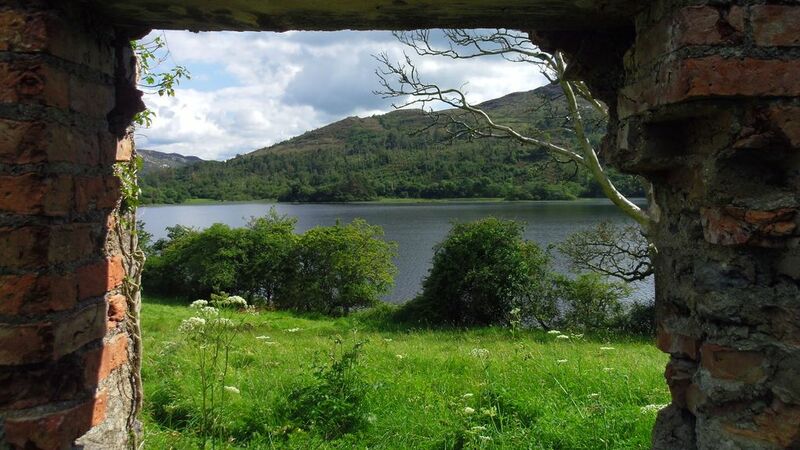 On July 27, the 55th Yeats School opens at the Hawk's Well Theatre, with literary and musical events, trips through Yeats Country over land and by water, plays, academic lectures and classes, and participation in the life of the town's other summer festivals all to come. Michael Longley will read his poems. A show of Jack B. Yeats's paintings is at The Model. The Tread Softly Festival, the James Morrison Traditional Music Festival in nearby Riverstown, the Strandhill Surf Festival, and Sligo Races all happen as July ends and August begins. Anne Margaret Daniel was associate director of the Yeats School for four years, and returns to Sligo whenever she can.